Staff and students from Bangor Business School were invited to this year’s CPA Australia Future Leaders' Luncheon an exclusive event held in London. 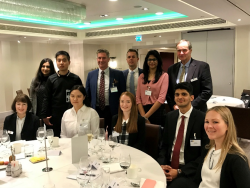 CPA Australia Future Leaders' LuncheonAccompanying Dr Annika Beelitz (Lecturer in Accounting) to the Future Leaders’ Lunch at the Sofitel London St James in October were top-performing Bangor Business School students Raja Asad and Rebecca Molloy. The event provided a fantastic opportunity to connect business leaders with young leaders of the future. An exclusive panel of business leaders all spoke about their respective career journeys, their experiences, and how to build a successful career. Our students were invited to take part in this exclusive event to represent Bangor University as one of only 16 institutions across the country.